J. William "Bill" Glassford coached from 1946 to 1948 at New Hampshire, where he compiled a 19-5-1 record. 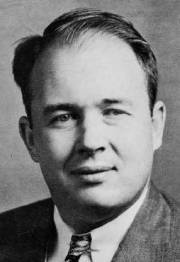 From 1949 to 1955, he coached at Nebraska, where he compiled a 31-35-3 record. He led the school to its first ever Orange Bowl. He had Nebraska's only winning seasons from 1941 through 1961. He played college football at Pittsburgh and was drafted by the Detroit Lions in the fourth round. He now lives in Cedaredge, Colorado. More information about Coach Glassford can be found here. This interview was done by David Max on April 21st, 2007. DM: Coach, how did you get the job at Nebraska? BG: Well, David, I was at the University of New Hampshire and we were lucky to have a record of somewhere around 20 wins to 3 losses. Potsy Clark was the Director of Athletics and got ahold of me at the coaches meeting in San Francisco and asked me if I was interested in the Nebraska job which I said I was. As you know, I played at the University of Pittsburgh and we played Nebraska all during the years that I was there. I had been interviewed the year before for the Colorado job. It came down to between me and Dal Ward and Dal Ward got the job. That's the format in which it came about and I was happy to become appointed to the position. DM: Did you negotiate your own contract or did somebody do that for you? BG: I didn't have a contract. I just took the job on the basis of one to one ties. In 1950, after the 50 season, I was on a trip with Dr. Gustaphson who was the President of the University at the time, and he said, "Billy, you need a contract." I said, "What do I do?" He said, "Go ahead and see the University attorney and he will draw it up for you." So that's how that came about. DM: Was it a culture shock coming to the Midwest from the East? BG: Well, I guess when you hire assistants, you hire people you know and who you have been associated with. I brought with me three assistants. Two of them had been at Yale when I was assistant coach there and one who was recommended to me by a friend of mine. That's how that came about. DM: What were the expectations from the fans in 1949? Were they as rabid as they are now? BG: They were as rabid then as they are now. They're a great amount of people and it's sort of a phenomenon. Of course we only had 49,000 seats at that time. The growth has been fantastic over the years at the University and also at Lincoln. DM: Who did you consider to be our biggest rival? BG: I think at that time, as you are probably aware of, Oklahoma was the dominant force. I think either between Colorado and Oklahoma at the time. DM: What were the facilities like compared to New Hampshire? BG: Of course the facilities at New Hampshire would not anywhere compare to what was at Nebraska at that time. From the standpoint of the stadium probably only 10 percent of the seating capacity at New Hampshire compared to what was at Nebraska. The in house training facilities and facilities for indoor practicing. The north end had the Field House (Schulte) that was the indoor facility that you could practice in when the weather was bad. DM: Tell us about Camp Curtis. BG: That came about, when I was at the University of Pittsburgh; the facilities at the mining camp in Windsor, PA, had a practice facility there. We always went up there for ten days before the season started. I was talking to the head guy at Curtis and they had a practice facility out there with dormitories and what have you. I suggested to him that it would be a good idea to bring the Nebraska football team out there and he thought it was a good idea so that's how it came about. For some unknown reason, I think we went out two years, the Chancellor decided it wasn't a good idea for us to go out there so he terminated it for us. But it was a good thing because you could get the players away from the facilities and what have you. It was adequate enough to accommodate the team's needs. DM: Do you have any Bobby Reynolds stories? BG: One of the finest backs that I was ever associated with. Every Saturday afternoon he did things that were remarkable. He was a great player. A great youngster. He would have been a great pro player but he tore up his ankle his senior year playing baseball and never recovered from it. DM: Are there any games that you would say he won single handedly? BG: Yes, I think the Missouri game in 1950. I can remember one distinct play that we were marching down the field for a score. It was a third down situation. He started to go around the end and they'd covered it pretty well and he started running back and forth, back and forth, and he got 25 or 30 yards. If he had been tackled we would have lost the ball but he turned around and came back and ran for a touchdown. It was an amazing run by him. DM: What was Tom Novak like as a player? BG: Fantastic. A tough team leader. He got hurt. He hurt his sternum and it bothered him quite a bit. When he graduated he had a chance to go to work for Hy ??? who had a business in Omaha. The Bears called a couple of times about drafting him. I called him in and told him to go to work for Hy. I told him the future there would be better for him than playing pro football. At that time, if you were a lineman, they only paid $100 a game. You know what they're making NOW. He was a fantastic guy. He had a great Nebraska feeling. A great team leader in the clubhouse. I can't say too much for him. He was a great player. I'd like to have 22 like him. DM: What were the road trips like? Did you go by train? BG: Well, let me see. Kansas State, we went by bus and also to Kansas. We went by train to Missouri. Oklahoma and Colorado we flew by plane. To Florida we flew by plane. DM: Tell us about going to Nebraska's first ever Orange Bowl. BG: We sort of backed into the Orange Bowl situation. We had a fair team, not our best team. The one in '50 was the best team that I had. I can't quite remember but Oklahoma was undefeated as I recall but they won the conference the year before and had been there the year before. The next team was Kansas State and Nebraska who were tied for second place in the conference but we had beaten Kansas State so we were chosen to go. The Orange Bowl had an agreement that our conference would play in the Orange Bowl so Oklahoma was not allowed to go because they had been there the year before and that's how we got in. DM: What was the trip like? Was it a media frenzy? BG: Oh, it was a great trip for the team. We played pretty well for a half but they had a great quarterback by the name of Sonny Jurgensen who played for the Redskins so we got trounced pretty good at the end. But it was a great trip. They had a lot of facilities to entertain the team and it was a great trip. When I was at the University of Pittsburgh we went to the Rose Bowl and it was similar to what the activities were at the Orange Bowl. DM: How big was the Nebraska fan base at the Orange Bowl? BG: I'm sorry I can't answer that question. There were quite a few people but I can't answer that question. DM: Charles Bryant, in 1954, was the first black player to earn a letter at Nebraska since 1913. What was it like for black players when you were the coach? BG: All the time I was at Nebraska we had three, Bryant from Omaha, McWilliams who was from McCook and I can't remember the name of the third one (Sylvester Harris). My memory is not as good as it used to be. All of them contributed quite a bit. It was on the verge of the black player becoming a dominant force in the athletic business. DM: You played against Nebraska in 1934 and 1936 while on the Pittsburgh team. What was it like to play in Memorial Stadium at that time? BG: We had a great rivalry with Nebraska because it was the longest trip we took with the exception of the trip to California. It was a great trip. We traveled by train and we were away from school for 4 or 5 days. We had quite a bit of excitement to get there and play there. DM: How was the crowd? Was there a large crowd at those games? BG: They were always full. DM: Do you have any recruiting stories? What was it like to recruit during the early '50s? BG: Our situation when we went to Nebraska was we had no scholarships. We recruited mostly in that area. Mostly in Nebraska. One of the great stories was, of course, Bobby Reynolds. After the '48 season, the year that I got the coaching job, we were on the way to the coaches' meeting in San Francisco and our train got stranded in Grand Island due to a snowstorm. There were quite a few coaches on the train and I was talking to the coach from Furman and all the coaches were getting off the train. I said, "Where is everybody going to?" He said, "There's a great high school prospect here by the name of Bobby Reynolds and they're all out trying to recruit him." That was my first impression of Bobby. When we got back the first thing we did was make contact with him and, of course, there were a lot of stories that he was going someplace else. His uncle was a contractor in Lincoln and he told me, "Coach, don't worry about Bobby. He's coming to Nebraska." We were assured that he would be there. He was a great player for us. DM: I belong to the Californians for Nebraska and I believe one of our members played for you. Do you remember a player named Don Glantz? BG: Sure. He was a good player. Good player. I was with Don a while back. My wife and I lived in St. George for a little while and Bill Holloran and Don Glantz and two or three others would get together every year in Las Vegas and so I went down and had lunch with them. I guess he's done quite well. I haven't seen him since that time but he was a good player for us. DM: Do you remember recruiting Tom Osborne? BG: I don't remember. I don't recall. DM: I was doing some research for this interview and it was said that he was recruited to play football and basketball but he wanted to play both sports so he went to Hastings? BG: To be very honest I don't recall. I remember Tom. I don't remember if there was any instance where he was told to choose. I don't recall talking to any prospect that was told he couldn't play both sports because Bobby played baseball and football. DM: Who were some of your assistant coaches? BG: My roommate at the University of Pittsburgh was fortunate enough to get the Yale job. I went there with him as an assistant. We had a couple of assistants that became good friends. One of them was Preacher Franklin and the other one is Jim DeAngelis. Jim became my line coach and Preacher was the end coach. I was allowed only three assistants. Bob Davis was the backfield coach. We had a big staff. I don't recall too much but I think we had somewhere around 40 to 45 on our squad. I'll tell you a little incident. I went back for the Hall of Fame team situation (2003) and I was sitting down on the field with one of my former players. One of the assistant coaches came over and the team came out on the field. This was practice on Friday. I said, "How many players do you have there?" He said, "120." I said, "120!! How do you handle them all?" He said, "Well, we have enough staff to do it." It was amazing the difference between now and then. DM: At the end of the 1955 season you decided not to exercise the five-year renewal on your contract. Why did you decide to leave Nebraska? BG: Well, my brother always used to tell me, "There's a time to come and there's a time to go." I just looked at the situation as far as I was concerned and as far as Nebraska was concerned and I decided at that time I would do something else. I talked it over with my family and we decided it was the best thing for me and the best thing for Nebraska. DM: What did you do after you left Nebraska? BG: I went into the insurance business in Phoenix. I went with the Equitable for a couple of years. I had a good friend, George Cook, who was the president of Bankers Life in Nebraska and they wanted to open the state of Arizona so they talked to me about it. I spent 20 years with them. Then I established a brokerage business with my son. He was a helicopter pilot in Vietnam. When he came back out of the service we started it and he still runs it and is doing very well. DM: Do you still follow the team? BG: SURE!! I live and die with them. I watch them every time they're on. DM: You haven't been to Memorial Stadium since the Hall of Fame ceremony in 2003. Do you ever plan on going to another game there? BG: I would like to but I'm 93 years old. My eyesight is pretty bad and my hearing is not too well. I had a hip operation so it's a very difficult thing for me to travel. Outside of that I feel like I'm in fairly decent health. I would like to but it's impossible for me. DM: What do you think of the current state of the Cornhuskers? BG: I think they're a great staff. It's one of those things where time will tell. I think the basic thing for today as far as staffs are concerned, especially in the top notch competitive areas which they're in, is the quality of their recruiting. I think the coaching regardless of who it is is pretty level. There's one thing about Nebraska. The fans. They think that Nebraska is the only school that should win every year. But the Texas people, they feel the same way. The Kansas and the Colorado people feel the same way. It's one of the things that they have to accept a few losses. It's good when they win them all but that's the way they feel it should be every year. DM: Do you think the Nebraska fan expectations are too high? BG: I think every school's fans are the same way in their expectations that they can win it all. That's the way the game is. That's the way that it is and you have to accept it. I think as far as the staff is concerned, they do the best they can and I think most of the Nebraska fans appreciate that. DM: Coach, thank you for sharing your Husker memories with us. It's really appreciated. BG: Thanks for calling. I hope I was able to give you some information.